REVIEW: I was so excited to read this book because the title's very intriguing. But when I read it, I wasn't as satisfied as I thought I would be. It was a relatively quick read; I was able to finish it in 2 days and I didn't even read it nonstop. The story revolved around two things in Hadley's life: her dad's 2nd wedding and Oliver, the British boy she met on the plane. Now I think it's safe to assume that, based from the title and the cover, it's a love story. But it focused more on Hadley's relationship with her dad and her struggle with accepting his new life with a new wife (to be) in London. I actually appreciate how Jennifer E. Smith was able to paint the picture in detail with flashbacks of Hadley's childhood or memories with her father. I usually don't like stories with protagonists who get overly upset about their parents' divorce because I happen to believe that at the end of it all 1) it's not your fault and 2) you should be happy with their decision. Or maybe because my parents are together. Whatever. My point is, I don't like it when protagonists are oozing with teen angst especially when either (or both) of their parents are trying to reach out. In this book however, I was able to understand what Hadley was going through emotionally because the backstories were nicely written. At some point I also felt bitter for her. Oops. 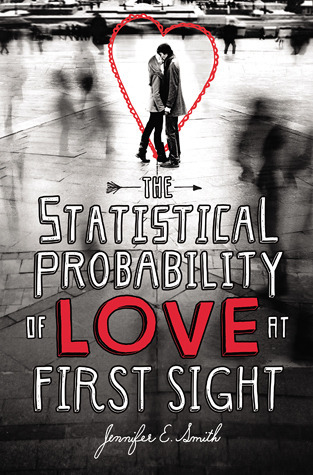 But this is my real issue: It's named The Statistical Probability of Love at First Sight when it didn't have much of it in the story. Yeah sure, Hadley and Oliver had a connection from the onset and that's basically love at first sight but it didn't play a big role in the story. At least not too big for it to be the title and the cover. I liked how they instantly clicked during the plane ride, how they were each other's comfort, and how they made me wish I had an almost-relationship like that but when I finished the book I was just left wanting more - and not in a good way! I would have wanted an Oliver (duh, British and goes to Yale? Yup)... if I knew more about him. I feel like the story lacked a bit of grounding for Hadley and Oliver's story. But that's just me. Maybe it meant more for other readers but for me, it was just one of those things that weren't significant enough to be the title. Or maybe... I just saw that the father-daughter relationship (should have) mattered more. I actually like the possibility that being late even for just four minutes can change your life greatly forever. For me the idea was there but it was raw. Nonetheless I'd still recommend this book because it's a nice quick read that's entertaining enough. And who knows, maybe you'd enjoy it more than I did.